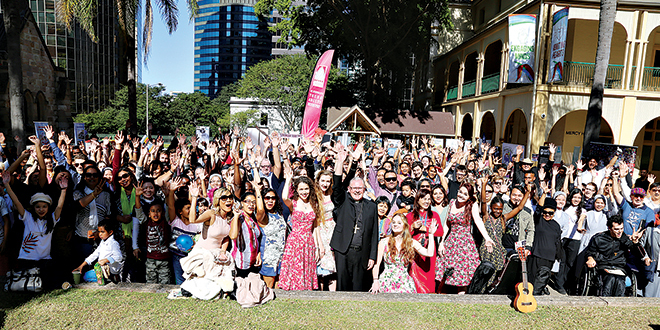 Youth gathering: Archbishop Mark Coleridge (centre) surrounded by the enormous crowd at the youth expo. YOUNG Catholics hitting a wall with their life vocation fired questions at priests and nuns outside St Stephen’s Cathedral last week. 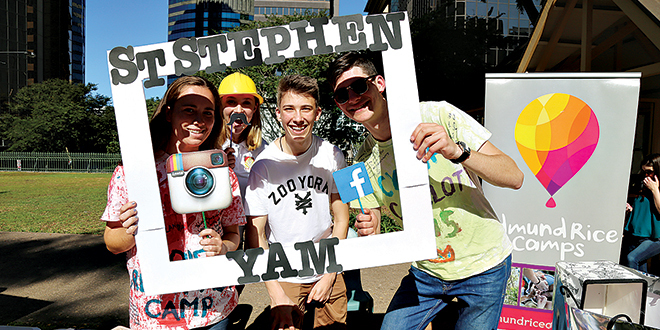 More than 200 young people wandered through the Youth and Vocations Expo, run by St Stephen’s Young Adult Ministry and Vocation Brisbane on Sunday, August 2. The annual event marked the beginning of National Vocations Week, held this year from August 2 to 9. 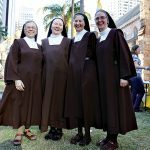 Religious sisters, brothers and priests from Brisbane congregations, including the rarely public discalced Carmelite nuns from the Ormiston monastery, shared their unique charisms with the youth outside Brisbane’s St Stephen’s Cathedral. Archbishop Mark Coleridge welcomed the youth to the cathedral during the midday Mass. 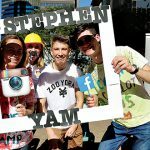 Canossian Sister Thao Nguyen, who works closely with the St Stephen’s YAM members, said the group’s sixth expo was not about any religious congregation “claiming” a young person. 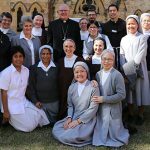 “We’re not here to claim people to our own vocations but to be able to say these are the choices in life and allow the young people to discern their vocations,” Sr Nguyen said. 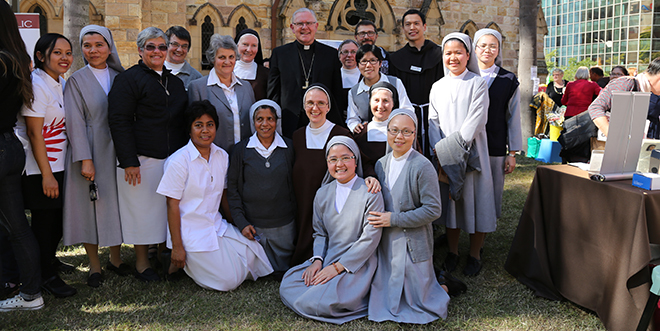 Joining Brisbane’s consecrated religious and priests were ministries connected with Catholic youth, including various ethnic communities, volunteer charities and cultural groups. 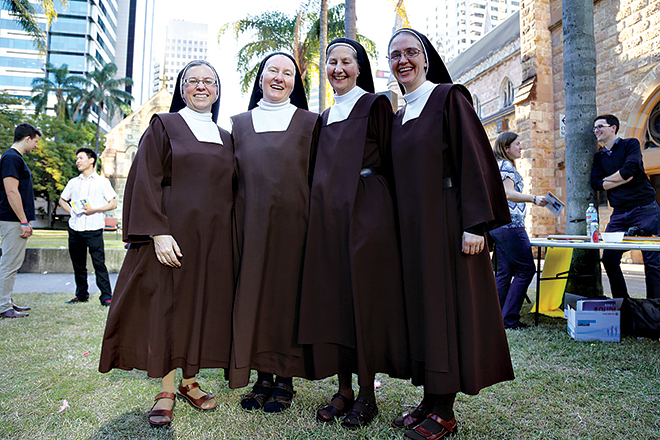 Vocation Brisbane officer Patrick Ransom said this year’s expo attracted twice as many ministries, religious congregations and visitors than 2014’s event. 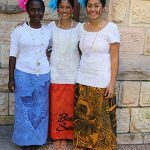 Mr Ransom said the 2015 expo placed a bigger emphasis on engaging multicultural communities, inviting them to showcase cultural dance and song. 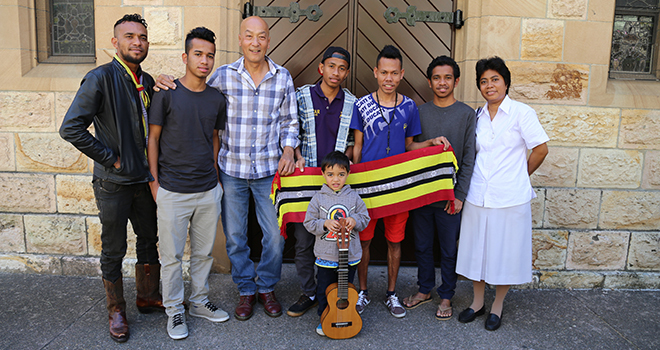 “To be able to have their gifits and cultural diversity on show is a real blessing,” he said. St Stephen’s YAM member Joseph Grogan said the central hope for the expo was to provide a “spiritually fruitful” event that cultivated “a culture of vocations awareness”. “Too often in contemporary society, vocations is almost isolated as being its own sphere, and in a very deep and reverent respect it is, but at the same token it shouldn’t be to the alienation or ostracisation of youth and young culture,” Mr Grogan said. Mr Grogan said it was a “pleasure and privilege” to welcome the Carmelite Sisters, who have not been to the cathedral since 2000. “Their religious witness is singular and deeply cherished between all of good faith,” he said. Youthful joy: Yolanda Lovie-Toon, Zuzana Horniak, Martin Horniak and Oliver Whightman enjoy the sunshine at this year’s youth expo. 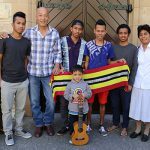 Proudly Timorese: Zu Da Costa, Abrao Amaral, Mario Ricardo, Gil Norris Da Silva, Moniz Pereira, Emilio Corrazon, and Sr Odete Moreira join their young East Timorese friend for a jam outside St Stephen’s Cathedral. 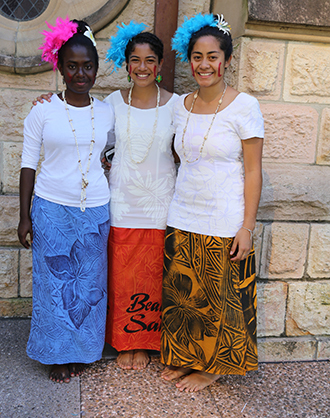 Tropical culture: Bethani Tukana, Grace Rita Thetadi and Kimri Thetadig from the Banyo-Nundah youth group. Annointed gathering: Archbishop Mark Coleridge (centre) surrounded by the enormous crowd at the youth expo. Rare sighting: Discalced Carmelite Sisters from Ormiston Sr Marie Tania, Sr Helen, Sr Moira and Sr Catherine Ann left the convent for a day to join with young people at the expo.